We are excited to announce the formation of middle school baseball and softball teams as a club sport this year at Kent City. The middle school softball team has joined a league including teams from the Muskegon area and will play 12 games this spring. They have been practicing since just before spring break and are scheduled to play this week. The team is being coached by Kent City Alums Nicole Vanloon and Danyle Bowers. The middle school baseball team is meeting every Tuesday and Thursday beginning at 4:00 p.m. to work on fundamentals of baseball. They will not be playing in conference this year, but will reevaluate before the 2020 season. At the first practice, Coach Chad Kik had 25 student-athletes on the ball field working on their game. We will keep everyone updated on the progress of the teams on www.kentcityathletics.com including cancellations which are looming for this week. It is a semi-repeat performance of 2018 when almost an entire week was lost due to ice and snow, but to a lesser degree. We will be watching the weather and checking our facilities throughout the week so stay tuned. Although the conditions were not superb last week, we had a fairly successful week in the world of Kent City Athletics. The varsity girls soccer team picked up a 5-0 win on the road against Carson City Crystal on Friday afternoon. Kent City now stands at 1-1-1, which is a record start for the program. After picking up a 1-0 lead in the first half compliments of a Natalie Snyder goal. In the second half, Jasmine Weeks exploded for four goals to give the Eagles their first varsity soccer victory since 2016 at the same exact location. Kent City’s varsity baseball team slipped by White Cloud in their first CSAA Silver game of the season last Tuesday, 9-8. Casey Carew, Brendan Boyd, and Bryant Fahling teamed up on the mound for the Eagles with Fahling picking up the win. Tied at eight in the bottom of the seventh, Rylan Kerwin took advantage of a couple of Indian errors to reach base and advance to third before Shawn Anderson hit a sacrifice fly to score the winning run. The second game of the double header was postponed due to darkness with White Cloud leading 6-3. 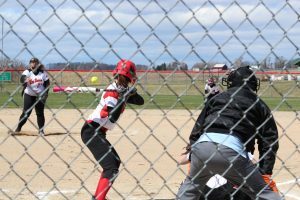 The varsity softball team played in their first games of the 2019 season, defeating White Cloud on Wednesday in the first game of a doubleheader 9-6. Alyssa Larson pitched the entire game for Kent City, earning her first win of the season. Larson also hit a three run homer in the 6th inning to take the lead for good. Kennedy Campbell hit two triples, while Kenzie Bowers had one. Mikayla Loew had two singles and a double and Samara Kolehouse had a single and a double. Game two was tied at 9 following 7 innings of play, but the game was suspended due to darkness. At Saturday’s Kubasiak Neighborhood Tournament, Kent City defeated Tri-County in the opening game 10-5. Alyssa Larson picked up her second win of the season in the circle. Kent City’s track and field teams participated in their first CSAA Silver meet of the 2019 season on Tuesday at White Cloud. The varsity girls’ team defeated the Indians 104-33 behind several great early season performances for the Eagles. 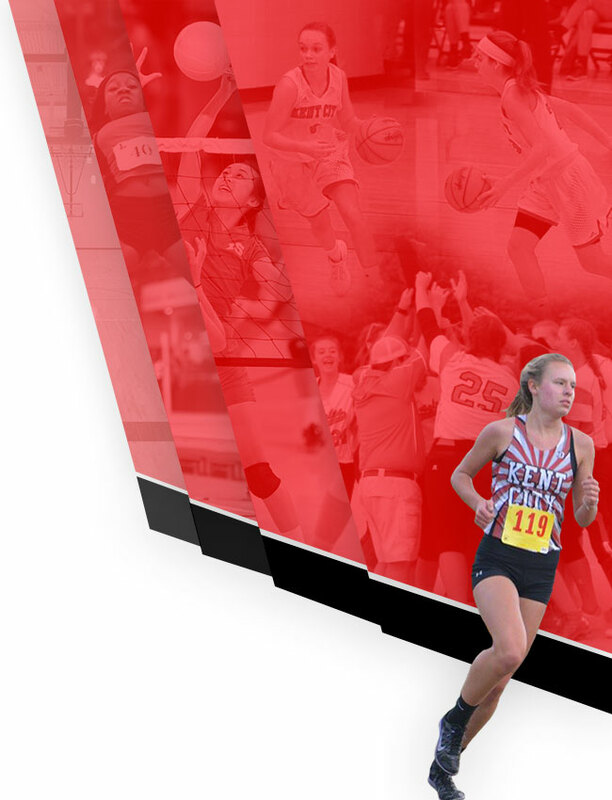 Event winners included: Joan Carr (100), Carley Denhof (200), Lauren Freeland (400, 800, Long Jump), Layla Martini (1600), Abby Ignasiak (3200), Zara Weber (100 Hurdles, High Jump), Taryn Preston (300 Hurdles), and Emily Lantzer (Pole Vault). The 3200m relay team members were Alyeska Linsley, Kierra Flegel, Kristen Toporski, and Elizabeth Sible while the 1600m relay team consisted of Preston, Lantzer, Martini, and Freeland. The sprint relays included Jasmine Weeks, Weber, Mikayla Plumb, and Carr in the 400m and Weeks, Mickenzie Brancheau, Denhof, and Carr in the winning 800m. The varsity boys’ track and field team also earned a victory over White Cloud, sprinting by the Indians 104-32. Giovanni Weeks lead the way for Kent City winning the 100 meter, 200 meter, 400 meter, and as a member of the 400 meter relay. Other winners included Carter Magoon (Long Jump), Trent Buckner (110 Hurdles), Dolan Bair (300 Hurdles and Shot Put), Jayden Williams (Pole Vault), Mason McVicker (Discus), Jaden Cato (High Jump), the 3200 meter relay team (Evan Jones, Nick Flegel, Alex Russo, and Ryan Wheeler), 400 meter relay team (Spencer Hartley, Dolan Bair, Giovanni Weeks, and Will Wright), and the 1600 meter relay team (Mateus Melllo, Evan Jones, Jayden Williams, and Will Wright). The varsity boys golf team tied Muskegon Oakridge and lost to Montague at a triangular meet at Moss Ridge Golf Course on Tuesday, firing a score of 193. Kent City was lead by Dylan Denhof with a 45, followed by Dakota Stevens (48), R.J. Mortensen (49), and Alec VanNorman (51). Tuesday, April 16 @ 4:00 p.m.
Kent City opens their home track and field season on Tuesday afternoon at Ward Memorial Field welcoming the Wildcats of Lakeview to town. Both teams easily defeated White Cloud in their first CSAA Silver dual as they chase yet another conference championship. Kent City should have little trouble with the Wildcats judging by last year’s match-up and the results from Lakeview’s first dual with Morley Stanwood. The Mohawks easily beat Lakeview in both the girls and boys meet and should not be able to keep up with Kent City. In fact, Kent City may have the first place finisher in every race on the day, the only events Kent City won’t be favored in will be a few of the field events. Last year Kent City’s boys’ team defeated Lakeview 89-48 while the girls’ won by a margin of 100-36. A big week for the varsity softball team as they play four conference games in three days. Kent City is 1-0 in the CSAA Silver with a tie that will need to be broken with White Cloud the next time the Indians and Eagles meet. Over the past three seasons, Kent City has been in the mix for a conference championship, including a share of the title in 2016. Kent City will need to win on the road this week, with both doubleheaders coming in enemy territory. On Tuesday, Kent City should have no problems with Lakeview who they invoked the mercy rule on in all four meetings last season. 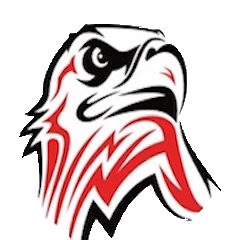 Following Tuesday’s games, the Eagles will turn their attention to the conference arch-nemesis Morley Stanwood who will be a good early season test for Kent City. Last year, Kent City held the upper hand over the Mohawks, beating them three times in four meetings. Thursday, April 18 @ 4:00 p.m.
Like the varsity softball team, this will be a pivotal week for the varsity baseball team. Unlike softball, baseball must also contend with pitch counts and available pitchers. The Eagles have more pitchers in 2019 than they have had in recent years who can hold their own on the mound. 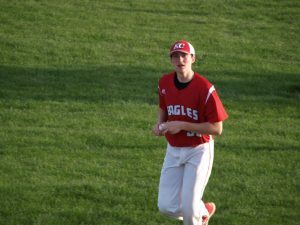 Kent City returns senior Casey Carew and Rylan Kerwin, as well as junior Eli Carlson who all have varsity experience on the mound. They also welcome several pitchers off from last year’s undefeated junior varsity baseball team (some of whom saw varsity action) in juniors Shawn Anderson and Brenden Boyd, along with sophomore Bryant Fahling. Kent City struggled against both Lakeview and Morley Stanwood last season finishing 0-8 against the teams combined. 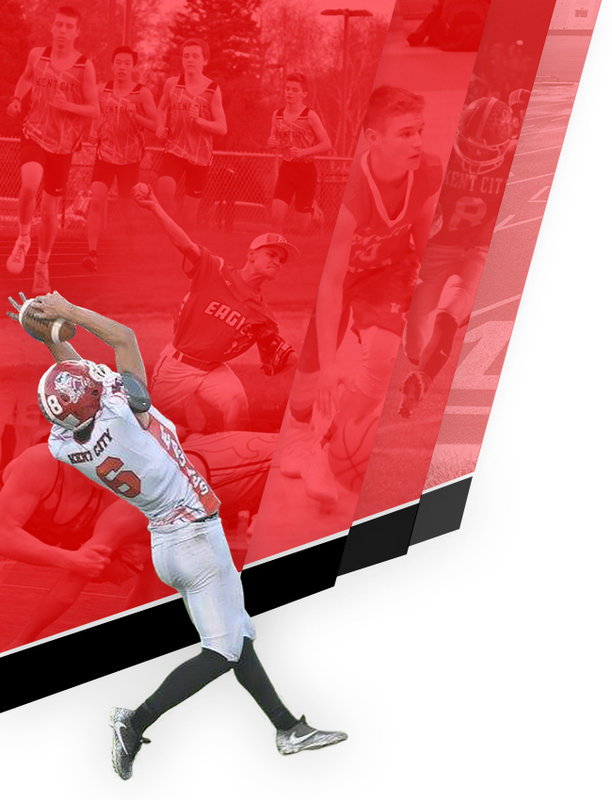 However, the influx of talent from the junior varsity combined with the experience gained by those on the varsity in 2018 should translate into some wins against these conference foes. Beating the defending CSAA Silver Champions (Morley Stanwood) will immediately put Kent City in the race for their first conference championship since 2016 when they finished 19-1 in the CSAA Silver. Saturday, April 20 @ 9:00 a.m.
For the second consecutive year, Kent City’s varsity boys’ golf team will host a golf tournament at the Falls. In 2018 Kent City finished in the middle of the field of ten teams with a team score of 403. With three more teams joining in 2019, the tournament has been split into two divisions. Team champion Kalamazoo Loy Norrix is back in 2019, but will play in the division with the larger schools. Kent City will compete against Tri-Unity Christian, Calvin Christian, Lakeview, Covenant Christian, Grant, and Hopkins. The top six golfers from each division will earn a medal. Kent City’s Jacob Rode won the tournament last year with a 79. 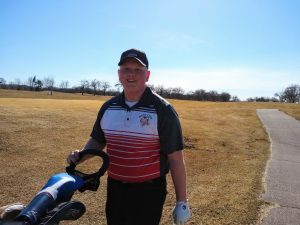 So far in 2019, senior Dylan Denhof has been the leader in the clubhouse, and would be a safe bet for a medal at Saturday’s tournament. Denhof did not compete last year as he had a conflict on the same day. Here is this week’s schedule. Home Games are in black. Away Games are in red. Practice Notes are in blue. Picture Notes are in purple. J.V. Softball vs. Greenville (Doubleheader) 4:00 p.m.